Born this time around into a South Philadelphia Italian-American family so traditional, she and her siblings are expected to marry in birth order, Eugenia lives a simple life―no love connection, no controversy, no complications. Her hope is that the Blessed Virgin Mary (who oversees her soul's progress) will grant her heart's desire, the option to choose the circumstances of her next life. But when a student reveals he shares her ability, Eugenia suddenly finds herself setting up a Facebook page and sponsoring a support group for others like her, an oddball odyssey, during which she discovers she must confront her current shortcomings before she can break the cycle and finally live the life of her dreams. 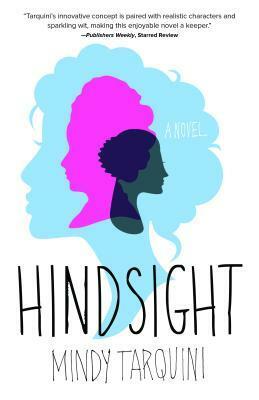 A layered contemporary fable, Hindsight reminds us to live this life like it's the only one we'll have. Hindsight was a good book. I think that the pa ing of this book was very fast! It had me on the edge of my seat to find out what happened next. The writing of this book was great and the transition between this world and past worlds was smooth. But the reason that I only gave this book 4 stars was because I feel like it was almost too fast at times. I felt like I should have made a chart just to keep track of all the characters and their backstories. But other than that I think that this book was very enjoyable.